Will we really lose all that land? 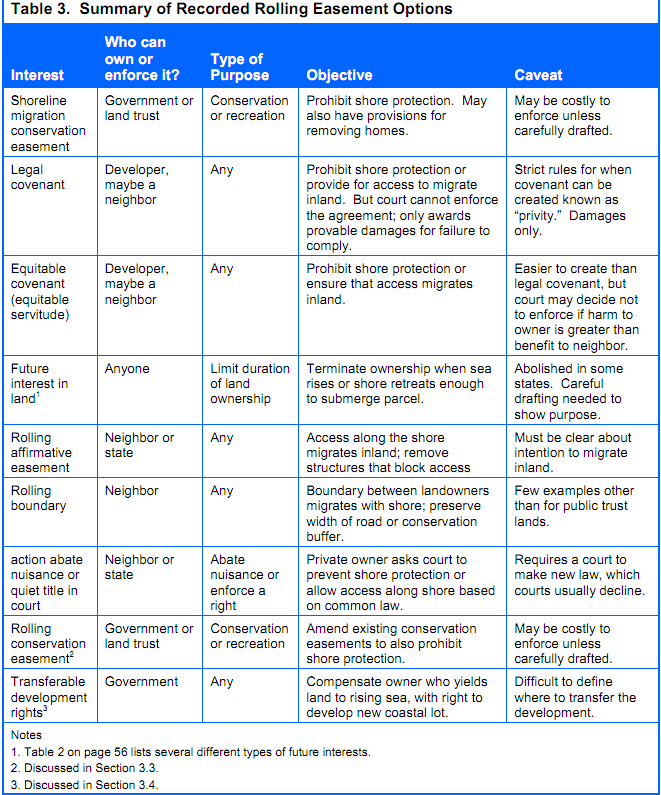 Table 3 summarizes the recorded rolling easement options examined in this primer. The most appropriate option depends largely on the objectives of the rolling easement and whether a government, land trust, neighbor, or developer is attempting to ensure that ecosystems or access migrate inland. Nevertheless, in most cases, more than one option is available that could serve the purpose. As the final column shows, however, none of the options can be guaranteed to achieve the objective under all circumstances. As we discuss in the next section, combinations of rolling easements may be more reliable than a single option. Careful drafting, study of the law in a given state, and management of the easement once it is created can all increase the likelihood of success. This page contains a section from: James G. Titus, Rolling Easements, U.S. Environmental Protection Agency. EPA‑430‑R‑11‑001 (2011). The report was originally published by EPA's Climate Ready Estuary Program in June 2011. The full report (PDF, 176 pp., 7 MB) is also available from the EPA web site. For additional reports focused on the implications of rising sea level, go to Sea Level Rise Reports.